The Faster You Run, The Quicker You’re Done! Did you know? A cross-country run for women is 5kms. Also, the best meal before a race is spaghetti as it is high in carbohydrates. Did you know? Cross-country is the only sport that has a true national championship and the perfect score is 15 points for the run for the top five contestants. Cross-country (x-country) running is a race on open-air courses over natural terrain such as grass or dirt. The course can typically be 4-12 kilometers long which can pass through woodlands and open country, it may include hills, flat ground and sometimes gravel roads. Cross-country is a sport most ages can enjoy. It usually takes place during autumn and winter. Are you getting ready for a x-country run? Here are four methods on how to train and prepare your body for it. Method one: Improving your running endurance. Try interval training: Switch between sprinting and walking in 2 to 3 minute intervals. Always plan an interval run at least once a week. Do tempo runs: Run at a speed of 15 to 30 seconds slower than your race pace to make sure you are controlling your speed. Run a speed play workout: This workout is to prepare you for the pacing of the cross-county runs. A good workout can last anywhere from thirty minutes to an hour. Work in longer runs: It is important to build your distance gradually. Every week you want to make sure you are adding a longer run in. Plan a recovery run: On the day after your longest run, do a recovery run to decrease lactic acid (a metabolic byproduct that makes no contribution to exercise performance) build up in your muscles. Work in cross-training days: While training for the races make sure you add four or five days that consist of running. Examples of cross-training workouts- swimming, biking, weight lifting, hiking. Add a rest day: Adding a rest day it allows your muscles to recover and avoids draining your body to exhaustion. Examples of rest day activities- stretching, walking, yoga, hot tub. Go cycling to increase your speed: Pedaling on a bike can help even out the cadence of your running. Weight training: Try weight training for endurance. Focus on your arms, legs and core. Start with light weights. Swimming: Go swimming for an upper-body workout. By swimming it can keep your body balanced. Method Three: Maintaining a healthy lifestyle. Get at least eight hours of sleep: Keeping healthy sleep habits will allow you to give it your all. Most adults and teenagers need at least eight to nine hours. Eating healthy: Eat lots of protein and carbohydrates. Carbohydrates provide the body with energy. Protein stabilizes blood sugar. Avoiding foods: Make sure to avoid high fat content foods. You want to consume more monounsaturated fats than saturated fats. Stay hydrated: Make sure you are drinking plenty of water (6-12 ounces a day). Method Four: Do your best. Inspect the race trail: Ask someone for a map of the course and examine it to make sure you are prepared for what is in store. Eating before: Eat high carbohydrate foods four hours before giving your body enough time to digest. Visualization: Imagine that you are already on the course running. Running: Make sure you keep your pace consistent. Exercising and strengthening before a cross-country run is very important. There are a couple of ways that will help you train. Leduc Physio’s two favorites are plyometric training and bodyweight exercises. Plyometric training refers to exercise that enable a muscle to reach maximal force in the shortest time possible. Bodyweight exercise are a great choice as you can do them in your home and do not require any equipment. 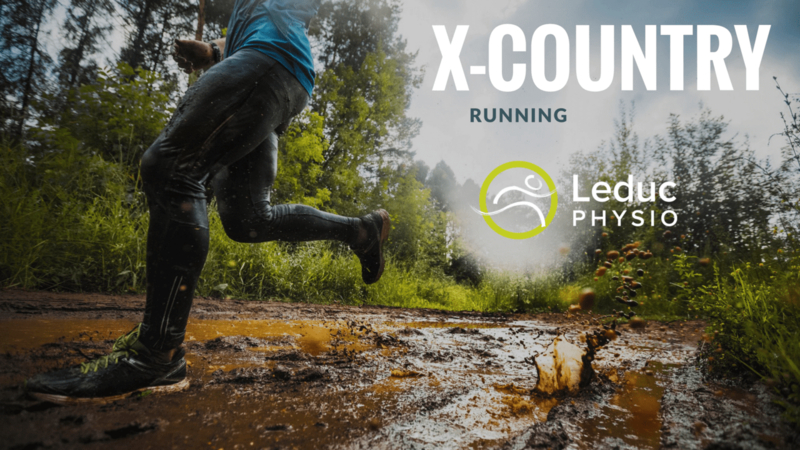 Leduc Physio utilizes many body weight exercises after completing a Running Assessment to adjust running mechanics and stride length.